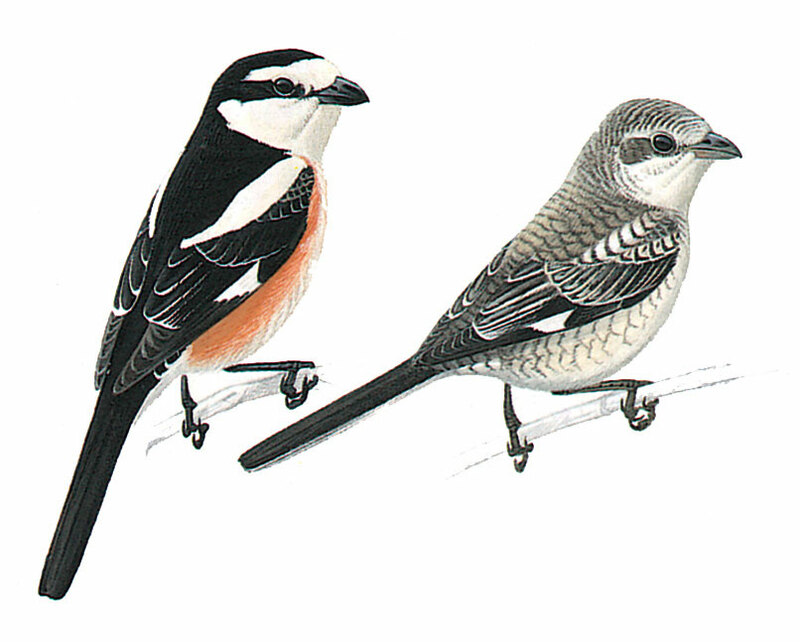 It is smaller and slimmer than the Woodchat Shrike, has a finer bill and longer tail. Adult is unmistakablewith black upper parts and mask (female duller, browish-grey) with white face. Flanks are washed orange with a distinctive white shoulder patch. Pale wing patch is noticeable in flight. Juvenile similar to juvenile Woodchat Shrike but has greyer upperparts, is heavily barred, the forehead and eyebrow are whitish, with a finer bill and longer tail. In flight it also shows a larger white wing-patch.. First winter bird resembles adult female but lacks orange flanks. Frequently perches on bushes with long tail slightly cocked and waved up and down.